the Boma-Gambella Landscape (BMP). WCS will replace the African Parks Network (APN) as the implementation partner. The BMP, which is funded by the European Union through IGAD, aims to improve the social and economic wellbeing of the populations in the IGAD region through a better regional integration in the environmental sector. 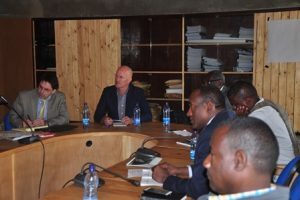 WCS was the ideal choice to be the implementation partner for this project as it has already been invited by EWCA to engage in protected area management in different parts of Ethiopia. In addition, WCS is currently working on biodiversity conservation on the Boma side of the landscape in South Sudan. Having an implementation partner on both sides of the trans-boundary landscape will improve the coordination and ease communication challenges of the BMP project. WCS has more than 100 years of experience conserving biodiversity, and, currently, it focuses on 15 priority landscapes throughout the world that comprise 50% of the world’s biodiversity. Its organizational mission is to save wildlife and wild places worldwide through science, conservation action, education, and inspiring people to value nature.